Last night was the last time I put Oliver to bed as a baby. He’s still my baby, of course, but today he started pre-k and will be going to school five days a week from now until…. As I put him to bed, I was aware of all of the changes we are about to experience. He is going to learn so much and make so many new friends. Last night I knew that as I took him to school in the morning, I was setting him up for his next stage of independence from me and Ken. So, I held him a little longer and nuzzled his curls on my nose, as I like to do, long after he fell asleep. He didn’t want me to sing him songs but, instead, asked nervous questions about his first day. “What do I do if I don’t understand the teacher? What do I do if I don’t understand what the teacher tells me to do? What happens if the teacher sends me home and puts me on the train by myself?” He was worried. I calmed his fears and he woke up this morning with a crazy, wild energy and anticipation to see his new school and meet his teachers. We started off by creating his pre-k poster of some of his favorite things this year. He was happy to answer all of them. This is what he looked like last year at the same time. Can you believe how much he has grown? The school is really close, less than a mile away and only two stops on the bus! Ken was working so I had to bring him and a suitcase worth of school supplies with me. You see the suit case in the picture but not the other bag I had on my shoulder. So much stuff! The school, which has over 500 pre-k students this year had the children come in two groups. We were the afternoon group. The good thing was that one of Oliver’s best friends was in the afternoon group. They are in different classes but that didn’t seem to get them down. Best friends at 2 or 3 months old. Too cool for school already! Once we got in, we found our classroom. Oliver has two very sweet teachers. They had toys set up for the children to play with and Oliver ran over without taking his backpack off and made himself at home. He was doing so well so I said a quick goodbye. Funnily enough, I didn’t cry! That’s so unlike me! Maybe because I had an hour and a half to myself that I decided to spend with some other parents I knew at a local cafe. I had the most delicious blueberry/hibiscus iced tea!!!! When I came to pick Oliver up, his teacher was finishing up a book. When it was done, the children noticed all of the parents in the room and ran to us. Class dismissed? I went to the teacher to thank her and she told me that Oliver made a prediction about the book! An “A” student on day one! That’s my boy!!!!! We left and got lunch with his friend at a local restaurant and then went to a playground to burn some energy. As we walked home, we stopped at another cafe and Oliver looked at me with those sweet eyes of his and pointed to a pink cupcake. How can I refuse him on his first day of pre-k? Today, my baby became a little boy. He started real school. He’s just going to keep getting bigger and older. I can’t even! 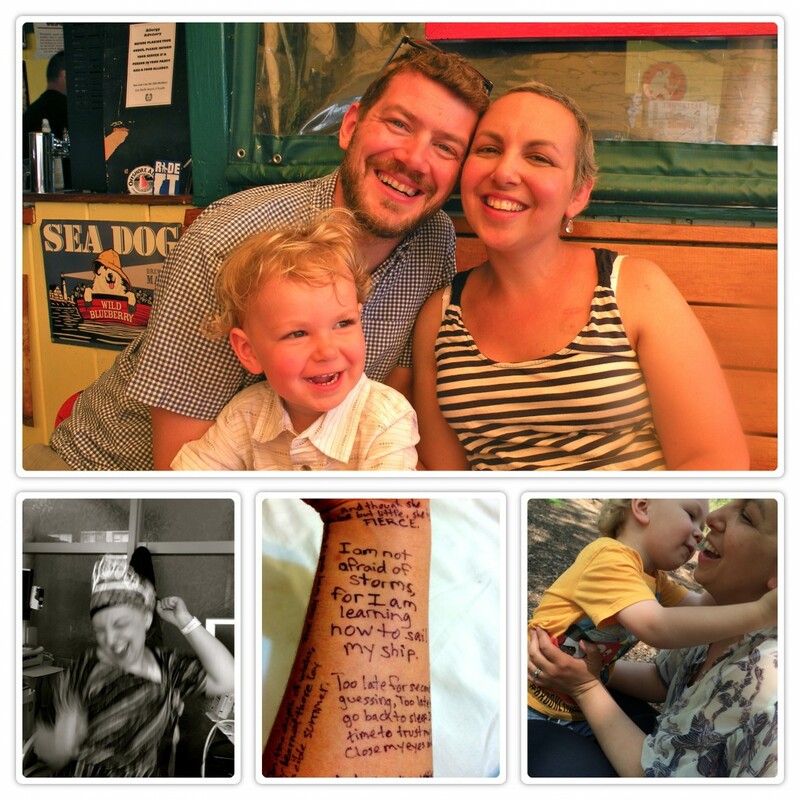 Categories: Uncategorized | Tags: breast cancer, first day of school, motherhood, pre-k | Permalink.